The dude from infowars, that’s bound to improve the thread. Edit: Maybe we can get Louise Mensch to react from the other end. Then Mike Cernovich. Just play tennis between the bad faith or just plain crazy grifters. The ABC has about as much credibility as infowars these days. Spending years peddling conspiracy theories about Russia. Give me back my tax dollars you thieves. GuzzLG’s complaint would appear to be with an Australian public broadcaster. Because he was saying people on the right actually did their research on this issue, unlike the corporate left. However these people just kept dismissing them because it didn’t fit their narrative in helping to create excuses to fight Russia . In reality a lot of the progressive left (true left IMO) have been saying the same thing. I think this demonstrates it’s more about establishment v anti-establishment these days, as opposed to left v right. I like a lot of PJW’s stuff, and I found the video a good representation of all the hysteria. I’ve never been an infowars fan as I also find it to also be hysterical. Anyway, just my two cents. Maddow, Stephen Colbert etc are flog elites who couldn’t give two ■■■■■ about your average pleb, even though they pretend to. They know they won’t be the poor bastards sent to war either. Just true scum bags to peddle this crap continuously for two years. Hysterical is a polite word to describe what Infowars is. They make their money, and presumably get their kicks, in part out of tormenting the Sandy Hook families and other similar fare. They’re the kennel of attack dogs like Roger Stone. It’s possible they even occasionally believe what they are saying - that’s the only point of interest really, how much they believe of the product they produce. PJW has occasionally made a bit of a home there. They and their equivalents are like the fossil fuel industry except it is the culture rather than the climate that gets warmed up and rendered more volatile in exchange for some tidy cash. 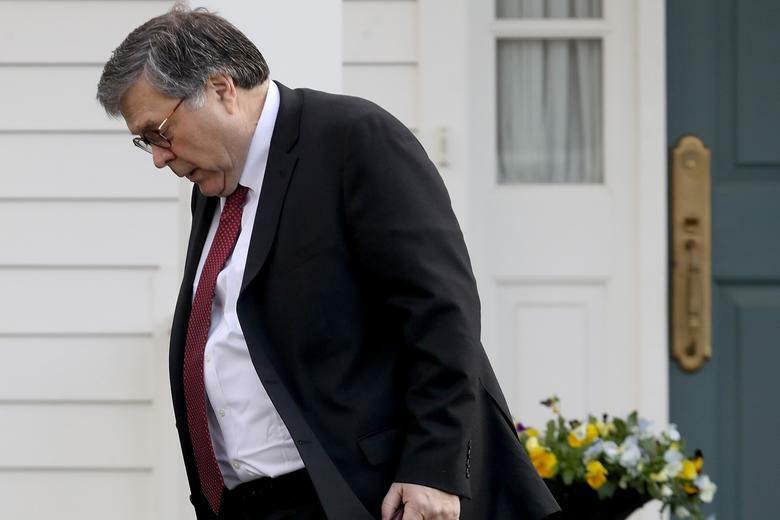 Neither the indictments that resulted from the investigation, nor Barr’s report clear Russia. Rather the opposite. They clear Trump of knowingly assisting them. So if it was about finding excuses to fight Russia, they are certainly all still there. Was it research or just that reality happened to coincide with that particular partisan talking point? If we are awash in sea of bad faith fake news then some one or another was going to get lucky at that moment. Because orgs of that ilk have made quite a few additional claims about the investigation and if it is truly about homework done then we can expect the whirlwind very soon. My belief from the start was Trump acted out of greed, arrogance and ignorance. It was the style of his while Presidential campaign, he was loud and said whatever got him a result. He was more than happy to go along with whatever opportunities were created by Russian electoral manipulation. Hell, he stood on stage and said it. Him being the mastermind on this scenario just doesn’t fit. Him being tangentially linked does make sense. The guy had serious dodgy business history with Russia. He’s got dodgy business history in general, but Russia is where he’s most exposed. Russia was the only place he could get financing when every bank in America turned him down. That finance deal has a stench to it. His dealings flowed all the way through the campaign. My thoughts on his business ethics have zero to do with him being President. They are the product of decades of his behaviour. So do I agree that the left media overplayed this story. Yeah. But it was a damn juicy story and if they didn’t cover it then something is wrong. Actually the coverage seemed rather intermittent due to Mueller’s incredible secrecy. Do I think Trump is dodgy. Yeah. Do I think he’ll be exposed by one of these lower level investigations with a serious business crime, hells yeah. Do I think he’ll be impeached, not a chance. Oh the left is the establishment argument. Facepalm. It’s not as if News Orgs are businesses or anything and thrive on ratings by providing the sort of content their audiences are baying for, is it?? Who really fkn cares? Obvious shitt is Obvious., … wow. It goes to the point that Kushner made, the campaign was too stupid to collide. Not organized enough. Fair bit of revisionist history to suggest that the so-called “main stream media” (#msm) has only focused on the Russian interference for 2 years. If you are a Trump supporter feel free to defend the above. The attorney general's summary of the Mueller report gets creative with the definitions of conspiracy, obstruction, Russians, and more. Not sure that any of this exists in US politics. Democrats and Republicans are both equally establishment, conservative, capitalist right wing groups. Some on both sides have minor progressive views, but both Parties reflect the majority conservative view of the USA. Their fight with each other is only about power and who gets the most pie. Stormy’s ex-lawyer Avenatti gets charged. Can’t say I will miss that guy. In comparison to Russiagate these issues have barely featured. 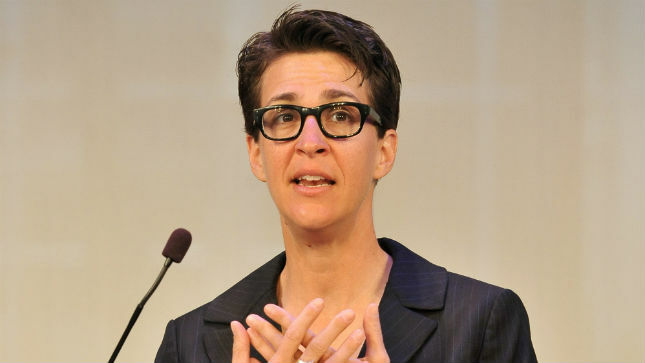 MSNBC host has Rachel Maddow dedicated 53 percent of her program over the past six weeks to Russia, according to a Thursday analysis from the left-leaning The Intercept. 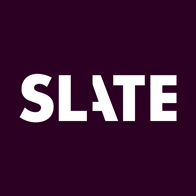 Here’s a great analysis by Aaron Mate who breaks down Russiagate and what it has done to public discourse and efforts to truly resist Trump. You’re absolutely right about Democrats vs Republicans - they’re both equally establishment and beholden to their donors. 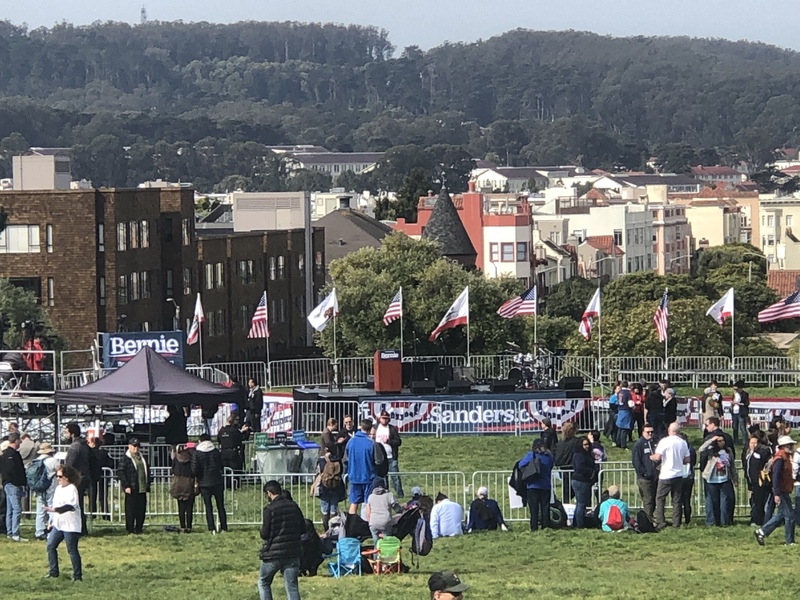 Waiting for Bernie to speak in my local park. 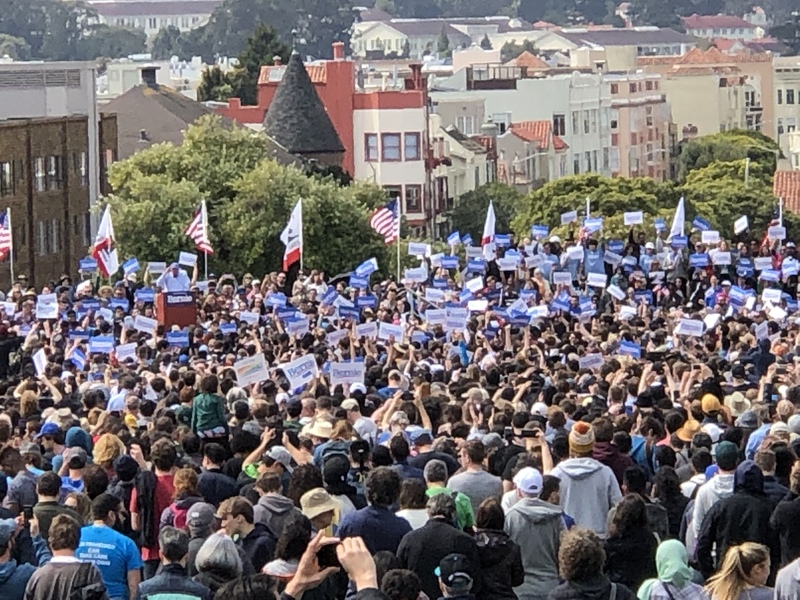 I’ve seen bigger crowds at the Undera local cricket match. This was 4hrs before. Line went quite a way. 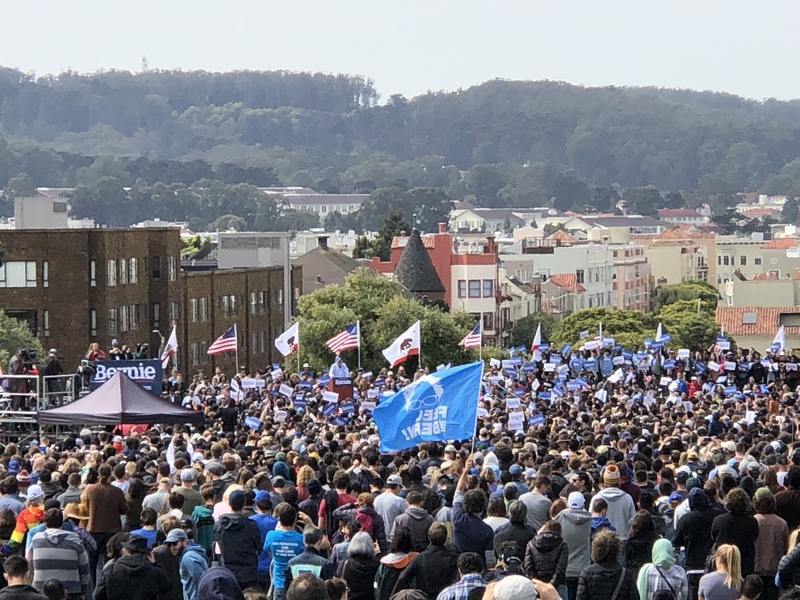 Here is a better photo (or 2) of the actual rally. Ha! I know that park… Ms AT lives a couple of blocks from there!